Naomi Rawlings paints vivid pictures with her words and transports readers to the rugged coast of Lake Superior. I love visiting Eagle Harbor and the extraordinary people who live there! Isaac Cummings and Aileen Brogan are each haunted by their pasts and struggle to overcome their sorrow and doubt. Inspiration weaves its way through their journey, and my heart was stirred for each of these compelling characters. Love’s Bright Tomorrow is a wonderful tale of mystery and romance and one I highly recommend! 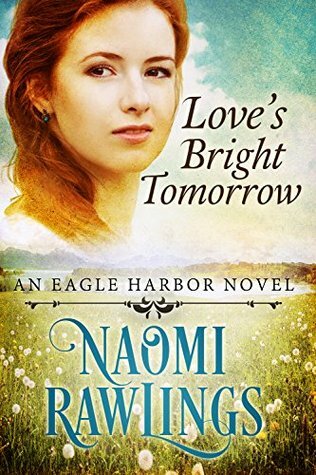 Love’s Bright Tomorrow is Book 6 of the Eagle Harbor series and can be read independently of its predecessors. However, reading the series in order has allowed me to come to know and love this historical Michigan town and its residents, and I have delighted in the opportunity to return with each release. Aileen Brogan wants a place to call home. After leaving Ireland for America and losing her father and brother within a year of each other, she feels lost and alone. No matter how hard she tries, she just doesn’t seem to belong in the quaint town of Eagle Harbor. However, Sheriff Isaac Cummings is determined to help her fit in—into town and into his arms—if only she’ll say yes to his courtship. But if he knew her secrets, he’d surely rescind his offer. Isaac is determined to serve the people of Eagle Harbor in a way that will do his family proud, but he’s haunted by past mistakes. When a band of criminals threatens his beloved town’s safety, he doesn’t want to fail the people he loves like he did four years earlier. But if he doesn’t turn out to be the hero the town needs, what chance does he have of winning Aileen’s resistant heart? When old wounds reopen, can Isaac and Aileen figure out how to move past their brokenness and find the promise of a bright tomorrow?